There is a sushi restaurant in the OSU campus area here in Columbus that allows patrons to essentially custom-design their own sushi. (For those who are curious, it’s called Fusian.) You pick the wrap, the fillings, and even the sauces. You then pay for and eat your creation. On the way out, I noticed the sign at the left. For the employees and patrons of the shop, it’s a clever way to say “you are what you eat” and, since what you eat there is something you get to create, if you are what you eat then you are also what you create. I would imagine most patrons walk out of there feeling good when they see that message, convinced that their custom-created sushi, made of fresh ingredients, has made them healthier. Nothing wrong with that. As a writer who has written several novels that are not publishable (and I don’t think I’m being hard on myself here), the message struck me on two levels. The first level was a kind of sadness. My inner critic popped up and said to me, “No novels on the proverbial store shelves yet, eh? 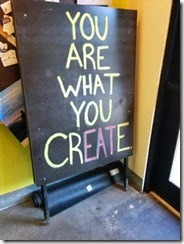 You haven’t really ‘created’ then, have you? If you are what you create, then you’re nothing, big guy…” While I don’t totally buy what he’s trying to sell me, he knows I’m disappointed that for all the hours I’ve put in, my writing’s just not there yet. My characters are flat, the plots lack escalating conflict, and my descriptions could certainly improve. But that’s as far as I’ll agree with him. I’m not published as a novelist, but I’ve been published in magazines and journals. So I have created, and it’s been good enough for publication. In time, I’ll work out the problems in my fiction and produce something I’m happy with – if not proud of. The quote hit me on another level, too. In his book Steal Like an Artist, Austin Kleon talks about how artists need to explore the work of other artists, the topics that interest them in life, etc. These things find their way into our subconscious and (for want of a better description) fill up a “creative gas tank” inside us. We want to be sure we fill that tank up with good stuff – stuff that makes us happy, gets us excited, or fills us with awe. When we finally sit down to create, our “tank” will be filled with lots of great fuel to work with. I’ve tried to fill my tank with good writing advice from the likes of Dean Wesley Smith, Mike Stackpole, the late Aaron Allston, Joe Konrath, and Joe Straczynski. I’m trying to inspire my creative side with the writing from great TV shows like Dexter, memoirs like Jackson Galaxy’s Cat Daddy, thought-provoking ideas like those in Susan Cain’s Quiet: The Power of Introverts in a World That Can’t Stop Talking, and Scott McCloud’s Understanding Comics. I’ve even started to engage other parts of my brain by trying my hand at drawing, painting, and sculpting. I may even try to learn to play the guitar at some point. I’m trying to give my creative tank a lot of good material to work with. If you find yourself blocked creatively, it might be time to sit back and asking if you’re taking in enough creative stimulation to fill up your inspiration tank. If not, get to it!